Some cheesecakes are made to be enjoyed. 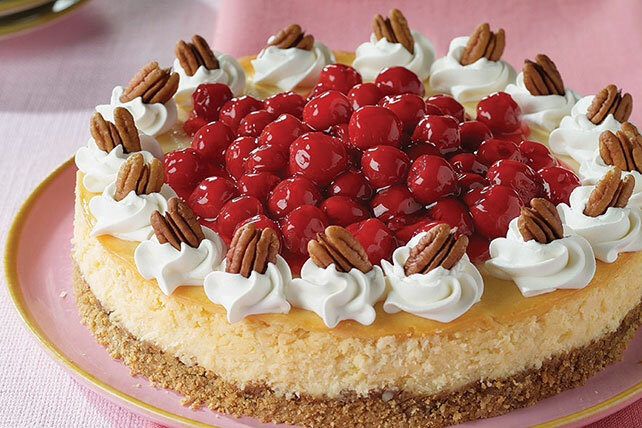 This White Chocolate Cherry Pecan Cheesecake is made to knock their socks off visually—and then to be enjoyed. Reserve 16 pecan halves for garnish. Finely chop remaining nuts; mix with graham crumbs, sugar and margarine. Press firmly onto bottom of pan. Beat cream cheese, sweetened condensed milk, chocolate and 1 tsp. vanilla in large bowl with mixer until blended. Add eggs, 1 at a time, mixing on low speed after each just until blended. Pour over crust. Bake 1 hour or until center is almost set. Run knife around rim of pan to loosen cake; cool before removing rim. Refrigerate 4 hours. Mix pie filling and remaining vanilla; spoon over cheesecake. Top with COOL WHIP and reserved pecans. Special recipes are fun to eat as part of an annual celebration. Enjoy a serving of this delicious dessert at your next party. Spread nuts in single layer on baking sheet. Bake at 350°F for 5 to 7 min. or until lightly toasted, stirring occasionally.